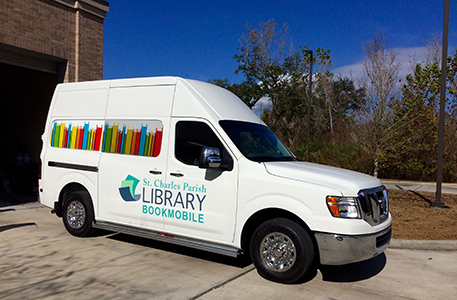 Our Bookmobile serves as a mobile library to senior centers and individual homes for St. Charles Parish residents who cannot make it to a library. It also visits St. Charles Parish daycares to help introduce children to books and reading as they develop school readiness skills. Due to the limited staffing and operating hours, our Bookmobile cannot visit all areas of potential need. Bookmobile stops are evaluated on an ongoing basis and may be cancelled, changed, or moved at any time. Contact us for more information about scheduling a Bookmobile stop.